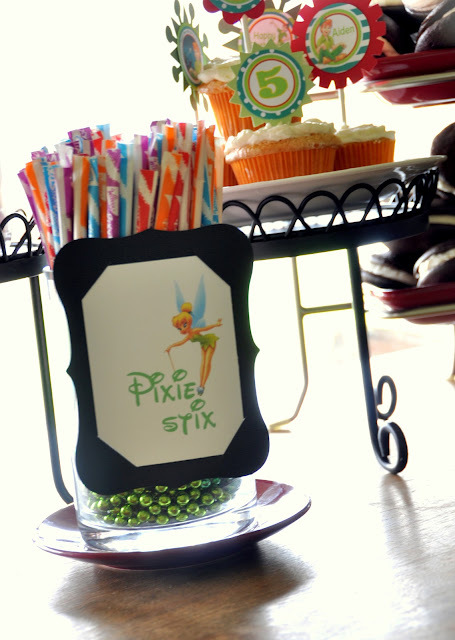 Peter Pan Birthday Party by Oh Snap! Hello to all of Honeybear Lanes wonderful readers! I’m Jamie and I blog over at Oh snap…a life in photos. I am so very excited and nervous to be guest posting today! I love Heidi’s blog, shop and quilts! I wish I had found her when my little guy was, well, little! A big Thank you to you Heidi for letting me share today! Today I am here to talk about a themed birthday party. I love a birthday party theme and throw an all out one every year for my sons’ birthday. He is 5 and completely obsessed with anything and everything Peter! Do you know how hard it is to find anything Peter Pan party related??? Tinkerbell sure no problem, but Peter, well he’s a recluse! 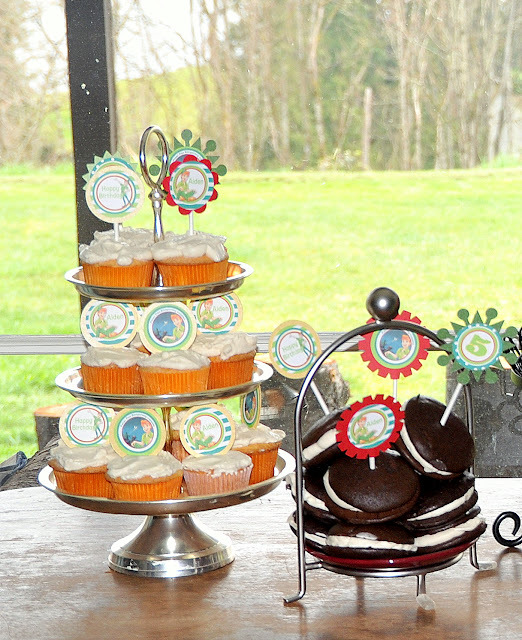 I did a lot of research and found a wonderful gal to help me out with some of the printable items like the cupcake toppers, thank you tags and bottle wrappers. Sure I could have done it all myself but I work and wanted to focus my time on assembly not designing. If you are looking for amazing service, wonderful party items or have an idea rolling around in your head I strongly suggest you head on over to Shindig Parties to go. Amanda is a dream to work with and produces wonderfully whimsical party accessories to fit any theme you want! Some of the elements being assembled. The birthday boy and his “friend” Lilli. The room right before the crowd arrived. The cupcake toppers in action. They turned out so cute! I just used my Cricut machine to cut them out! The dessert table…mmm. 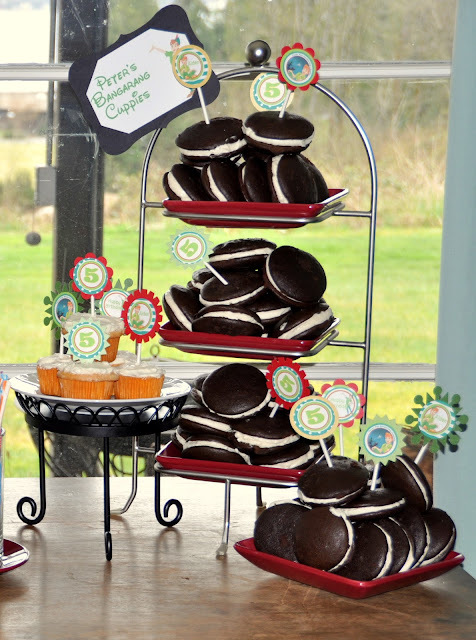 Butter cupcakes and Whoopie Pies or “Double cakes” as my son calls them. 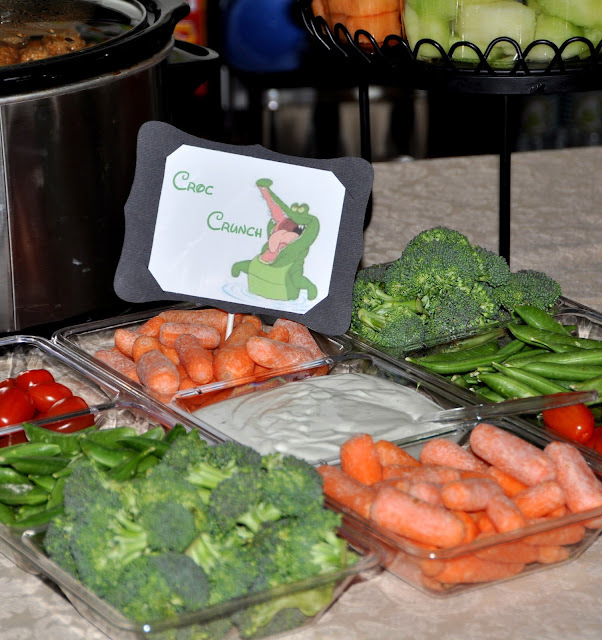 We tried to come up with fun names for our snack table too. The pennant banner was super easy to construct. It turned out so cute…just how I pictured it! The adorable water bottle wraps from Shindig! The mantle, even our friendly Elf on the Shelf Henry, joined us for the celebration! My friends adorable girl dressed as Tiger Lily! We had it all, Pirates, Wendy, Micheal, 2 Tiger Lilys, Tink, a treasure chest, Lost boys, and of course Peter! This little guy, Aiden’s best buddy, thought up his own costume as a treasure chest! Awesome! Closer up of the pennant! This is sort of how we all felt by the end of the day…but it was a great party! Mixed in with all the cute we had a treasure hunt for the real treasure chest pinata. There were other games lined up as well, but sometimes you just need to be crazy & run around and play! Thanks for letting me share with you all! I certainly enjoyed myself and I hope the next party you throw is full of fun! Thank you so much for sharing!! Didn’t that party turn out so cute? I wish I had enough time to do something as fun as that!! WAY cute! What a fabulous party. So glad I found you since just today I blogged about how we'll be having a Peter Pan party for my little girl next month. Thanks for sharing!! It was so fun to come up with ideas. I mean it when I say there is nothing out there for a Peter Pan party, but it came together nicely! Jamie I love the food tags! Any chance you could share a copy of the tags that I could print for my son’s party? my email is lherrmann03@yahoo.com Thanks! Please can you share with me for our party as well?? Please! did she ever send you the tags for the food? Wow, Jamie did such a great job! And thanks so much for mentioning Shindig Parties TO GO, too! What a wonderful memory for all of the kids! this really is adorable, what did you name the fruit platter ? I would like to know that myself! lol I am planning a Peter Pan party this weekend and would like to know what she named it. What font is the wording on the food signs? I’ll be doing this party in the winter! Thanks! This was originally a guest post, but I will try to contact the author!